With all the new ideas thrown at you when you begin a raw food diet, do you really have spend mental energy worrying about onions? While there's no question that onions look relatively benign when lined up against the great disease-causing foods humans regularly consume, such as meat, dairy, and eggs, they have enough downsides that I've eliminated them from my diet. Do they have beneficial compounds? Sure. You can find the upside to virtually any plant food if you look hard enough. Even poison hemlock has plenty of nutrients. The question is if a food's downsides are outweighed by its potential for good. Whether you think onions pass muster is up to you, but you should be informed about what they are. Onion Toxicity: Are Onions Good For You? Are onions good for you? Their miraculous qualities are often touted today among the foods-are-healthy-drugs crowd, as they have been for millenia. They can cure soar throats and act as an aphrodisiac, ancient Indian texts tell us (1). The Egyptian nobility and peasants were so enamored with the onion's supposedly life-giving properties that they worshiped it, and the Romans believed onions could induce sleep and heal mouth sores, dog bites, toothaches, dysentery and lumbago (2). Do these healing properties sound familiar? They should. You probably hear million-dollar marketing machines touting very similar properties for name-brand drugs all the time. Onions may have been around longer, but it's hard to make a profit off them so their promotion is mostly relegated to home remedy and herbalism books. Yet the message is the same for onions and drugs: this is a substance that can act on your body to get rid of a symptom of disease, a message that should immediately set off warning bells in your head. Onion Toxicity: What Are Onions, And What Do They Contain? Onions, like the very similar shallots, leeks, chives, scallions, and garlic, are part of the Allium family (lilies). Allium is a genus of perennially-growing bulbous plants that produce a series of chemical compounds such as cysteine sulfoxide, isoalliin, syn-Propanethial S-oxide, allicin, and mustard oil, which are responsible for their distinctive taste, smell, and the irritation they cause to your body. Different members of Allium have varying levels of these chemicals, and their pungency generally depends on how much they carry. Onion Toxicity: What Is Allicin? Allicin is a sulfur compound found in onions responsible for a lot of the irritation the plant causes. "Since allicin is anti­ fungal as well as antibiotic, it could offer the garlic plant protection against the bulb decay induced by fungi. And since the lacrimatory factor is irritat­ing and repugnant to certain animals, it too has survival value." -Eric Block, Ph.D., "The Chemistry of Garlic and Onions." Essentially what we have is an element - just one of several sulfur compounds present - that is intended to repel and injure things that would devour the plant and bulb, be they fungi, bugs, of mammals. When onion extract is applied to bacteria and fungi it literally destroys them. Many a canny gardener has realized this and strategically planted onions, garlic, leeks, and other members of the Allium family to ward off pests. Many creatures will not cross a phalanx of allium, and so can't get to the juicy tomatoes waiting beyond. Their senses warn them that this is a food to avoid. Although we like to think of ourselves as a species apart, at the end of the day we are just big, smarter-than-average animals with vulnerable physical bodies, and if a food is damaging enough that it destroys fungi and other bacteria and drives hungry animals away, it probably isn't wise for us to ignore the fact. While working as a newspaper reporter several years ago I ran across a man in a retirement home in Meriden, Connecticut that grew up on a onion farm in California. Always interested in agricultural life, I struck up a conversation and he told me something interesting: onion toxicity had almost killed him. His mother died when he was 13 and since his father wasn't much of a cook, the boy was frequently hungry. To supplement his unappetizing meals, he would take breaks during his farm chores to eat onions. "I didn't like them raw at first, but after awhile they started tasting great," he told me when I informed him that I found the taste of onions to be sickening. Although he didn't connect it to the onions, he became increasingly pale and weak over the course of a few months until one day he collapsed while doing his chores. He awoke in the hospital getting a blood transfusion, and was told that he'd come down with severe case of onion-induced anemia and had been dangerously close to death. After treatment he went on to a full recovery, but, he said, "I haven't eaten an onion since. When they try to put them in my food here I throw a fit." Although no full-scale tests have been done on onion toxicity in humans, for obvious reasons, there are plenty of instances of all types of animals, large and small, being sickened and killed by onions when their senses don't do a good enough job warning them away. For instance, a group of water buffalo that ate some onions dumped in their field all died (4). A study on geese found that onions killed them too, with an autopsy revealed swelling of the liver and spleen (5). In a herd of cows that had 20 onions a day per cow added to their feed for six weeks, five cows died and two pregnant cows lost their calves. Anemia is the initial result of onion toxicity, the researchers found, but it eventually lead to organ damage and death (6). It's is certainly one of the bizarre peculiarities of our mind that we can look at something in animals and see the cause of sickness and look at the same thing in ourselves and see a potential benefit. Despite the well-documented ability of onion intake to bring on anemia in sheep (7), Cats (with just onion powder added to their food) (8), horses (eating wild onions) (9), and dogs (10), researchers have cooed over new studies showing this effect in humans and praised the onion's ability to thin the blood in the hopes that it might help us fight blood clots and prevent heart attracts, which folk lore says it does. A 1979 study in India compared three groups of vegetarian Jains who ate an average of 600 grams of onions per week, 200 grams per week, or never in their lives. The study found that the onion abstainers had the shortest blood clotting time and that those who ate more onions had the longest time till clotting (11). "The (positive health) folklore concerning garlic and onions seemed to be gaining some credence," said chemist Eric Block of the finding, noting the food's potential as an antithrombot­ic (11). The mature way to deal with atherosclerosis is to eat a low fat plant-based diet that prevents and reverses it (12), and given that blood clots almost always affect sedentary, overweight individuals eating poor diets, the way to prevent them is to get regular exercise and eat a healthy diet. Poisoning ourselves in the perverse hope of escaping the consequences of a bad lifestyle won't work. 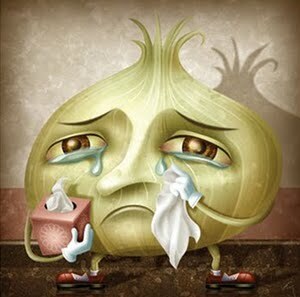 When you slice into an onion and start to get teary eyed, doesn't it strike you as a bit odd? You haven't even put the thing in your mouth yet your body is already irritated. When an onion is sliced and the cell walls are broken, enzymes called alliinases begin a complex chemical reaction that results in the release of volatile gas known as the onion lachrymatory factor. This gets released into the air and eventually enters your eyes if you're hovering over the onion. The gas stings and irritates your eyes, and the tears that well up are your body's attempt to wash the toxic gas out (3). I've sliced into a lot of peaches and hacked apart more than my fair share of lettuce, but none of these foods have been so irritating that my eyes had to wash the resulting chemicals away with bodily fluids. You have to wonder about exactly how toxic an onion is when the gas of it alone makes your eyes tear up. What's it doing to you when you put it into your stomach? Onion Toxicity: But What About All Those Benefits? The cures attributed to onions are essentially drug reactions and the resulting stimulation of your body attempting to rid itself of harmful substances. Treating yourself with an onion is like taking a drug in the hopes that your body will stop producing that symptom. And just like drugs, when you rely on such a treatment you never remove the underlying cause and merely hope any side effects brought about by the drug reaction will be bearable. Onions and other members of the Allium family may cause bad breath, indigestion and acid reflux (15), anemia, reduced blood clotting, or even death. Pregnant women should avoid the Alliuin family because its members have been known to cause accidental abortions in humans (13). Nursing women should not eat them because the chemical Allicin enters into their breast milk and disturbs a baby's ability to breast feed (13). Those at risk for major bleeding, such as those soon to undergo surgery or enter into labor are urged not to eat members of the Allium family because they have been shown to prevent the clotting of open wounds (14). Onion Toxicity: But What If I just Eat A Little? Although dogs have shown the beginning stages of anemia after only a single dose of onions (10), it's probably true that it takes sustained intake to bring about any noticeable negative impact. The average westerner only uses onions as a condiment, so irregular use may be fine. But don't fool yourself, a little bit of poison is still a poison. Even the Jains eating fairly modest portions of onions showed reduced blood clotting ability. You could gorge all day on watermelons or bananas and show no ill effects beyond a bloated stomach. Take the same dose of onions, though, and you'd probably be very sick. Although like all foods, onions have some up sides, the overwhelming force of them is negative. I don't eat onions or garlic, but I have periodically tried the weaker variates of the Allium family, such as the leaves of the chive plant. After so long without these foods I find them unpleasantly strong and that my breath reeks of them for days, but overall I don't run into any significant problems. If you want to include these foods in your diet periodically, I don't think it's going to be a deal breaker, but it's probably safe to say that onions and the Allium family should not be a regular part of your meals. Make delicious low fat dressings and sauces that taste great without onions and the rest of the Allium family. Disappointed that onion toxicity eliminates your favorite family of foods? Find out which foods are health promoting and which ones are dangerous. 1) Simoons, Frederick (1998). Plants of life, plants of death. Univ of Wisconsin Press. p. 568. ISBN 0299159043. Retrieved 2009-07-13. 5) Crespo R, et al. "Effect of feeding green onions (Allium ascalonicum) to White Chinese geese (Threskiornis spinicollis)." J Vet Diagn Invest. 2004 Jul;16(4):321-5. 6) Rae, Ha. "Onion toxicosis in a herd of beef cows." Can Vet J. 1999 Jan;40(1):55-7. 7) Knight, AP. Et al. "Adaptation of pregnant ewes to an exclusive onion diet." Vet Hum Toxicol. 2000 Feb;42(1):1-4. 8) Kaplan, AJ. "Onion powder in baby food may induce anemia in cats." J Am Vet Med Assoc. 1995 Dec 1;207(11):1405. 9) Pierce, KR. Et al. "Acute hemolytic anemia caused by wild onion poisoning in horses." J Am Vet Med Assoc. 1972 Feb 1;160(3):323-7. 10) Harvey, JW. Et al. "Experimental onion-induced hemolytic anemia in dogs." Vet Pathol. 1985 Jul;22(4):387-92. 12) Ornish D, Brown SE, Scherwitz LW, Billings JH, Armstrong WT, Ports TA, McLanahan SM, Kirkeeide RL, Brand RJ, Gould KLCan lifestyle changes reverse coronary heart disease? The Lifestyle Heart Trial. Lancet. 1990 Jul 21;336(8708):129-33. 13) Barnes J, Anderson LA, Phillipson JD. Herbal Medicines. 2nd edition. London: Pharmaceutical Press; 2002. 15) Allen ML The effect of raw onions on acid reflux and reflux symptoms. Am J Gastroenterol. 1990 Apr;85(4):377-80. ASK KRISTEN STEWART----GARLIC AND ONION ARE POISON. dish in the rooms of the home, (probably only two rooms back then). The doctor couldn't believe it and asked if he could have one of the onions and place it under the microscope. She gave him one and when he did this, he did find the flu virus in the onion. It obviously absorbed the bacteria, therefore, keeping the family healthy. I do know that I contacted pneumonia, and, needless to say, I was very ill... I came across an article that said to cut both ends off an onion put it into an empty jar, and place the jar next to the sick patient at night. It said the onion would be black in the morning from the germs...sure enough it happened just like that...the onion was a mess and I began to feel better. This is the other note. Lots of times when we have stomach problems we don't know what to blame. Maybe it's the onions that are to blame. Onions absorb bacteria is the reason they are so good at preventing us from getting colds and flu and is the very reason we shouldn't eat an onion that has been sitting for a time after it has been cut open. 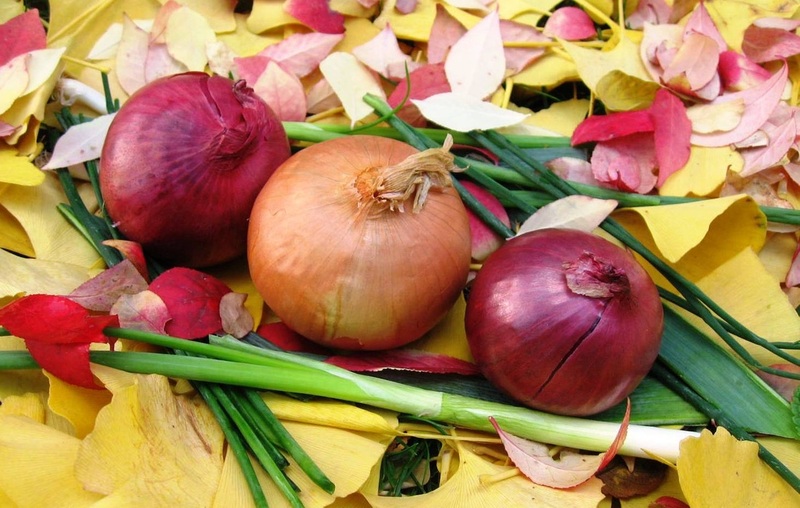 Dogs cannot metabolize onions, and should never eat them. One of the mo "Why don't you eat garlic and onions?" You may know that onions and garlic are botanical members of the alliaceous family (alliums) - along with leeks, chives and shallots. According to Ayurveda, India's classic medical science, foods are grouped into three categories - sattvic, rajasic and tamasic - foods in the modes of goodness, passion and ignorance. Onions and garlic, and the other alliaceous plants are classified as rajasic and tamasic, which means that they increase passion and ignorance. Those that subscribe to pure brahmana-style cooking of India, including myself, and Vaishnavas - followers of Lord Vishnu, Rama and Krishna - like to only cook with foods from the sattvic category. These foods include fresh fruits, vegetables and herbs, . Specifically, Vaisnavas do not like to cook with rajasic or tamasic foods because they are unfit to offer to the Deity. Rajasic and tamasic foods are also not used because they are detrimental to meditation and devotions. "Garlic and onions are both rajasic and tamasic, and are forbidden to yogis because they root the consciousness more firmly in the body", says well-known authority on Ayurveda, Dr.Robert E.Svoboda. Akarma (Karma free) Food: Why no onion and Garlic? akarmafood.blogspot.com/p/why-no-onion-a­nd-garlic.html26 Sep 2011 -- Onions and garlic, and the other alliaceous plants are classified as rajasic and tamasic, which means that they increase passion and ignorance . I was heart broken, when I heard of this because I love the smell of garlic and onions ... but oh well ... once you find out they are a neuro poison then it makes al .